The Globe reports the Senate wants the MBTA to look at electrifying the Providence and Fairmount lines - with the goal of having them run on electricity by 2022. WBZ's Ryan Kath runs alongside the sprinting commuters at the Westwood/128 station, as they try to get to their cars and to the furshlugginer exit gates that now routinely keep people trapped inside the garage for 20 minutes every evening. Kevin Essington reports 100+ commuters were left stranded at the TF Green stop on the Providence Line this morning when two trains breathed their last. Reminder: The governor of Rhode Island wants the T to start express service from Providence to Boston. Flattened car on Primrose Street in Roslindale. Trees fell, power lines snapped and cats raced through apartments looking for a safe space as the Great Sou'easter of 2017 roared through the state overnight. Read more. Transit Police report a man, about 30, was on the Northeast Corridor tracks near 700 S. Main St. around 10 p.m. when he was hit by an outbound commuter-rail train. Absolutely silent on my CR train this morning. It's like we're all in mourning of the death of someone we know. Amtrak catenary tester testing catenaries at Readville. A downed power line near the Rte. 128 station continues to frustrate MBTA commuters, who find their trains running way late, if not just canceled altogether. 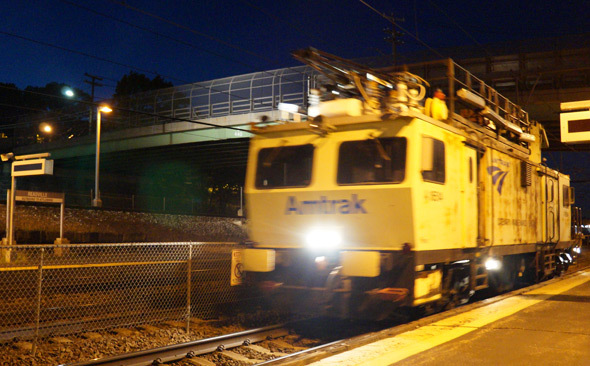 Around 9:05 p.m., an Amtrak catenary-testing train slowly moved outbound on the inbound tracks at Readville. Read more. An overhead wire that obeyed the laws of gravity near the Westwood train station is wreaking havoc on the Northeast Corridor this afternoon, causing massive delays for both Keolis and Amtrak riders in both directions - including many Pearl Jam fans trying to get to Fenway Park for their concert tonight. Read more. Somebody was hit by a train near Mansfield station this afternoon. The station itself was shut - and the parking lot is closed - and delays persist along the Providence Line. 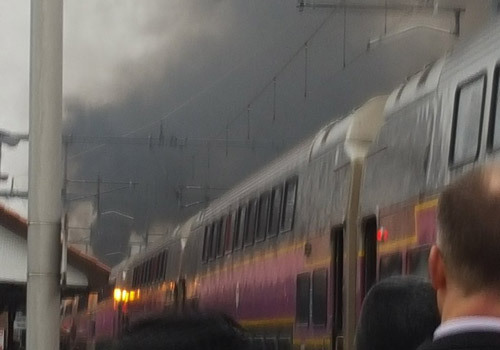 An Amtrak train headed to Boston lost power this afternoon, and possibly had a bit of a fire, an MBTA commuter-rail train was enlisted to push it to Boston and now things are still bollixed up betwixt Boston and Providence. At 7:19 p.m., Brian Moore reported that after 89 minutes, his Stoughton-bound train from Back Bay still hadn't made it to Westwood. The T was reporting similar delays from Providence to Boston. "This can't be good," Stephanie Davis thought when her train, the 808 out of Providence, pulled into Attleboro this morning. Just a flesh wound, though and she reports the train is now slowly chugging its way north to Boston. Still, accommodations must be made: Read more. People heading into Boston on the Providence/Stoughton Line are not liking how slowly their trains are moving due to what the T says are Amtrak signal problems. Trains that pass through Forest Hills are being forced to slow down due to Amtrak signal problems, the T reports. At least easier to nap in the dark. In other T news, inbound Red Line trains have "minor" delays due to a switch problem near Andrew; inbound Orange Line trains have similar delays due to signal problems at Ruggles.